FILE - A shipping container stands in position during a demonstration by the press freedoms organization Reports Sans Frontier (Reporters Without Borders) in Paris, Dec. 16, 2014. Reports from inside Eritrea describe inhumane conditions where prisoners are held in shipping crates in the desert. The reported death of an Eritrean political prisoner has shined a spotlight on the country’s secret prison system, where some of the nation’s founders have been held without trial for more than 16 years. A post on an anonymous Facebook page in February said that Woldensae died on January 25 and was buried on the premises of the Eirairo prison, where he had reportedly been detained. The claims have not been independently verified, and press freedom in Eritrea is severely restricted, making it difficult to confirm information that comes out of the country. Woldensae’s brother Sengal told VOA that the family still doesn’t know whether he is alive or dead, but they have long believed the worst. “All prisons in Eritrea are like Enda Hawya — a place where you can see people go in but never come out,” he said, referring to a village in a grim Eritrean fairy tale. Woldensae was arrested in a roundup that targeted dissidents in Eritrea’s ruling political party, journalists and others. The group of dissidents had called for the implementation of the country’s 1994 charter and demanded a democratic form of government. They became known as the G15. Most of the political prisoners have not been heard from since their arrest. Pleas from family members and human rights organizations for access to the detainees have gone unanswered. The Eritrean government’s last direct word on the G15 came in June 2016, when current Foreign Minister Osman Saleh said Woldensae and the other G15 members were all still alive. “The government is looking for their safety. They are in good hands, in prison. They are political prisoners and the government is dealing with them,” he told Radio France International. 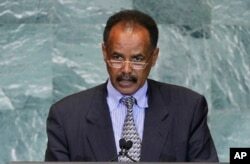 FILE - President Isaias Afwerki of Eritrea addresses the 66th session of the U.N. General Assembly at U.N. headquarters, Sept. 23, 2011. President Isaias Afwerki has ruled Eritrea with an iron hand since the country won independence in 1993. A 2013 report by Amnesty International identified 34 prisons in the country, both secret and recognized. The report said Eritrea’s government was responsible for the arrest of 10,000 political prisoners, although none had ever been charged with a crime or faced trial. Reports from inside the country describe inhumane conditions where prisoners are held in shipping crates in the desert where temperatures reach 50 degrees Celsius (122 degrees Fahrenheit) during the day. Rumors of prisoner deaths due to illness and suicide have been widely circulated, though never confirmed. Fisseha Tekle, a Horn of Africa researcher at Amnesty International, said families of those jailed are desperate for information. He believes the government owes it to these families to account for the imprisoned. Woldensae’s family has accepted that they likely will never see him again, but they believe, if he died, that it was because he stood up for his beliefs.